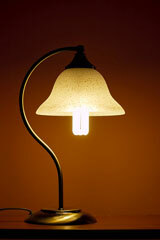 A lamp shade is a conical, cylindrical, or other shaped form that covers the light bulb on a lamp. While the lamp shade has a utilitarian purpose — to diffuse light or to block it so it doesn't shine in one's eyes — it also factors heavily into a room's decor. Today's lamp shades are made in various fabrics, metals, and plastics, or even stained glass; their scales, shapes, trims, and linings differ as well. Many home decorators believe that the lamp shade is as integral to the ambience of a room as the lamp itself, so choosing the right lamp shade has become somewhat of an art form. If the role of the lamp is to create focused light, such as that used for reading or doing tasks, the shade should be large enough for a higher-wattage bulb, and should also have a large enough bottom to cast light on the book or area where work is being done. On the other hand, if the goal is ambient light — light that is softly diffused around the room — a lamp shade with a larger opening in the top will allow light to bounce off the ceiling and spread around the room. Different lamp shades will pair with different lamps, depending upon the shape and proportion of the lamp. When purchasing a lamp shade it makes sense to take the lamp with you to best determine what appeals to you. However, there are several rules of thumb when it comes to choosing a lamp shade. First of all, the lamp shade should be large enough to cover the socket and hardware of the lamp. In addition, the lamp shade and the lamp should never compete with one another. This means that if you have a particularly ornate lamp, you should choose a simple lamp shade. On the other hand, if the base of the lamp is simple, you may choose a more decorative lamp shade with good results. In terms of proportion, the size and shape of the lamp shade should be similar to the size and shape of the lamp. For example, a wide, square base will look best with a large, square shade, while cylindrical bases will look best with round and oval shades. Avoid mixing shapes, or putting wide shades on narrow lamps, and vice versa. Always make sure that the bottom of the lamp shade is wider than the widest part of the lamp base. In addition, always apply the three-quarter rule when choosing a lamp shade. This rule states that the lamp shade should be about three-quarters the height of the lamp base. Finally, consider safety when choosing your lamp shade. 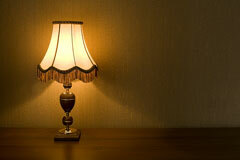 The opening of the lamp shade must always be wide enough to adequately vent the heat from the light bulb. Generally, the narrower the opening of the lamp shade, the lower in wattage the light bulb should be. If a lamp shade is hot within ten minutes of turning your lamp on, it's a good indication that a lower wattage bulb is required. In addition, there should always be about three inches of clearance between the lamp shade and the light bulb. New Brunswick Lamp Shade Company - source for wholesale lamp shades made in the USA. Jenkins Lamp & Shade Mfg - wholesale lamp and shade manufacturer, based in Arkansas. 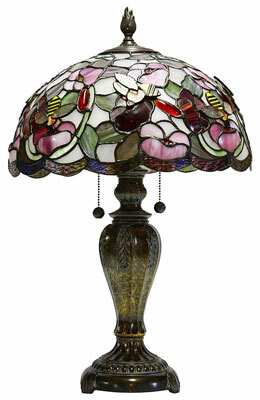 Hoyle Lamps - offers lamp shades and lamps as well as lamp shade and lamp repair services. J. Harris Lampshades - manufacturer and distributor of hard back and soft tailored lampshades. Lamps Plus - offers an extensive range of shades for all types of lamps. Matthew Lamp Shade - designers and manufacturers of hard and soft back lamp shades.